MANILA -- It’s just right that President Rodrigo Duterte permanently terminated the peace talks with the Communist Party of the Philippines (CPP) as the Reds are just using the talks as a “deceptive ploy” to replace "the government with a proletarian dictatorship,” a ranking official of the Armed Forces of the Philippines (AFP) said Friday. 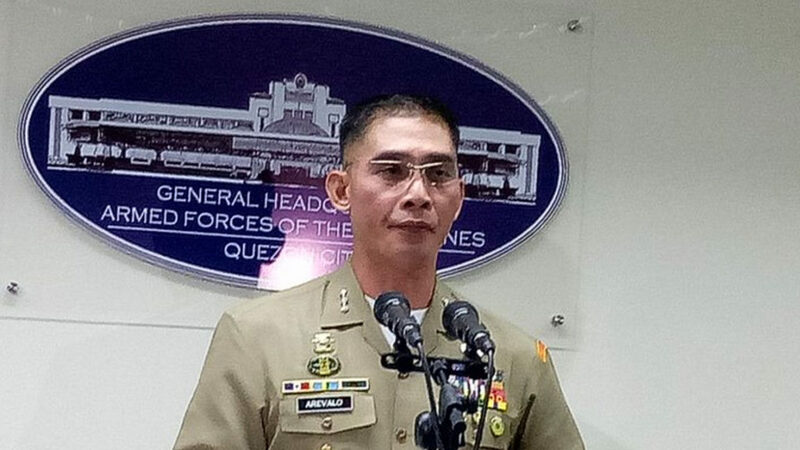 AFP Deputy Chief-of-Staff for Civil-Military Operations, Brig. Gen. Antonio Parlade Jr., welcomed President Duterte’s announcement on permanent termination of talks with the communists and the latter’s preference for localized peace engagements. Parlade said the CPP and its founder, Jose Maria “Joma” Sison, were just using the the peace talks not to really attain peace but to gain international publicity, raise funds and increase their strength. “Thirty-one years of deceptive ploys using peace talks, across five administrations, only resulted to more terrorist NPAs (New People’s Army) being released, an opportunity for the Communist Terrorist Groups (CTGs) to recruit and recover lost areas of influence, publicity for Joma in the international arena as a 'dove', wasted government funds spent for negotiations and junket, opportunity losses for investments and development because of prolonged and intermittent fighting,” Parlade said in a message sent to the Philippine News Agency (PNA). The CPP and its affiliates, he said, have badly handled what probably was their best chance for peace when President Duterte offered them the proverbial olive branch on the very first days of his term, pointing out that the Chief Executive even appointed their nominees to his Cabinet as a sign of good faith. Duterte has appointed UP professor Judy Taguiwalo and former Anakpawis party-list Rep Rafael Mariano to head the Department of Social Welfare and Development and Department of Agrarian Reform, respectively. He also appointed former Gabriela party-list Rep. Liza Maza as secretary of the National Anti-Poverty Commission. Taguiwalo and Mariano were both rejected by the Commission on Appointments while Maza resigned from her post. “But they blew it by attacking projects, killing security forces, and even innocent civilians,” Parlade said. The President scrapped the peace negotiations in early 2017 after the CPP-NPA carried out consecutive attacks on security forces and civilians despite existing unilateral ceasefires announced by both the government and the communist movement. Parlade also derided recent attempts of the CPP to resume the peace talks, saying these were made due to the movement's diminishing resources and field strength. “Now that their foreign sources of funding are threatened and droves of regular NPAs are surrendering with our E-CLIP ( Enhanced Comprehensive Local Integration Program), they again attempted to reach out to the President,” Parlade said. The E-CLIP, which was institutionalized by President Duterte on Apr. 3, 2018, provides a complete package of assistance and interventions to former communist rebels and their immediate families to prepare them for integration to mainstream society. These include skills development training from the Technical Education and Skills Development Authority, PhilHealth enrolment, housing, livelihood and legal assistance, among others. Nevertheless, Parlade doubted that a resumption of talks with the Reds would yield better results. “We can’t expect a better result with another round of talks without Joma changing his end state - which is still a national democratic revolution and supplanting our government with a proletarian dictatorship. Read the CPP Constitution and Programs, series 2018, and it is still there" he said. Parlade said the government is ready to finally end the communist threat through Executive Order No. 70 that President Duterte signed on Dec. 4, 2018. EO 70 provides for a whole-of-nation approach in defeating the local communist terrorist groups. “The NTF-ELCAC will finish this terrorist menace once and for all, and with that comes real government service, not tokenism, livelihood for the poorest especially in conflict affected areas, legal action for those who support these terrorist group, an entire bureaucratic convergence to address issues exploited by dissidents and a determined leadership. With President Duterte himself leading the charge, how can we go wrong?” Parlade said. Parlade also lambasted Karapatan and Ibon Foundation for their consistent lies. “How can they sell their fabricated stories of killings, worsening cases of alleged human rights violations when apparently Filipinos are happier with current policies of the government? We just climbed 2 notches higher in the World Happiness Report. They just have to work harder with their lies,” he added. Meanwhile, AFP spokesman, Brig. Gen. Edgard Arevalo, slammed Sison for calling President Duterte “stupid” for pursuing localized peace talks with the NPA instead of re-engaging with the Utrecht. “Mr. Sison has the temerity to call President Duterte ‘stupid’ for thinking that government will be successful in attaining peace by engaging NPA commanders and fighters on the ground instead of the CPP-NPA’s national leadership,” Arevalo said in a statement. “Mr. Sison speaks like a smart aleck to conceal his panic. He is of course aware that localized peace engagement has been immensely successful,” he added. He said since January 2018, localized peace talks have resulted in the surrender of more than 11,000 NPA regulars and supporters who have realized the deception made on them by the CPP-NPA-National Democratic Front (NDF) leadership that are mostly based in Utrecht, Netherlands. “They have realized that they have been deceived and have descended from their mountain hideouts to rejoin their families, avail of government benefits, and live normal lives,” Arevalo said. He said Sison, whom he described as an old man enjoying life in the Netherlands, is doing everything to prevent localized peace talks because it will further relegate him and his ilk to insignificance. “Mr. Sison consistently calls localized peace talks as a waste of people’s money, cheap trick, absurd and stupid, and by other deriding terms. But enough is enough,” Arevalo said. He added that 50 years of duplicity, deceit, and murder of thousands of his comrades on mere suspicion of being military informants or have expressed desire to go back to mainstream society must stop, not tomorrow but today.